For the past week and a half, ever since I saw that the loquats on my tree were ripe and ready for harvesting, I have been meaning to make Schlupfkuchen. Which I finally got around to doing today! 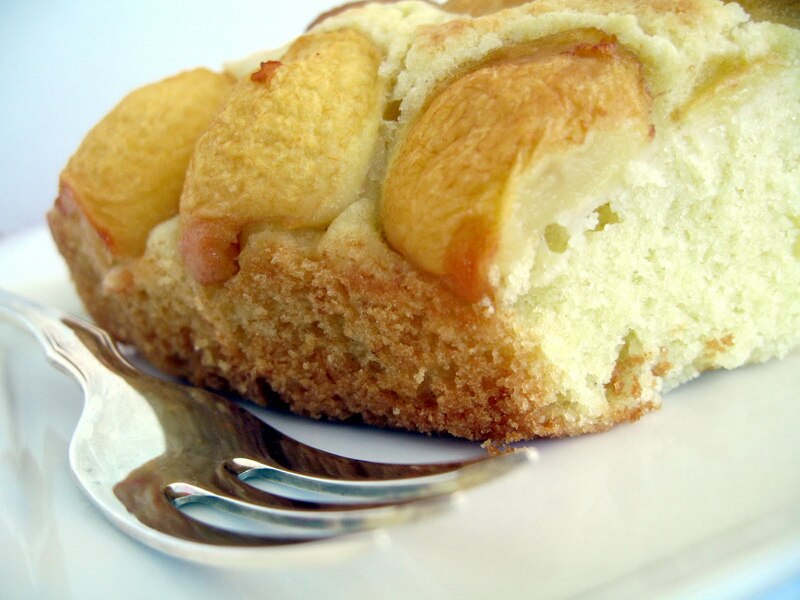 This cake is one of the classic German recipes I got from my grandfather, Gerhard Sommermann, with a California twist. 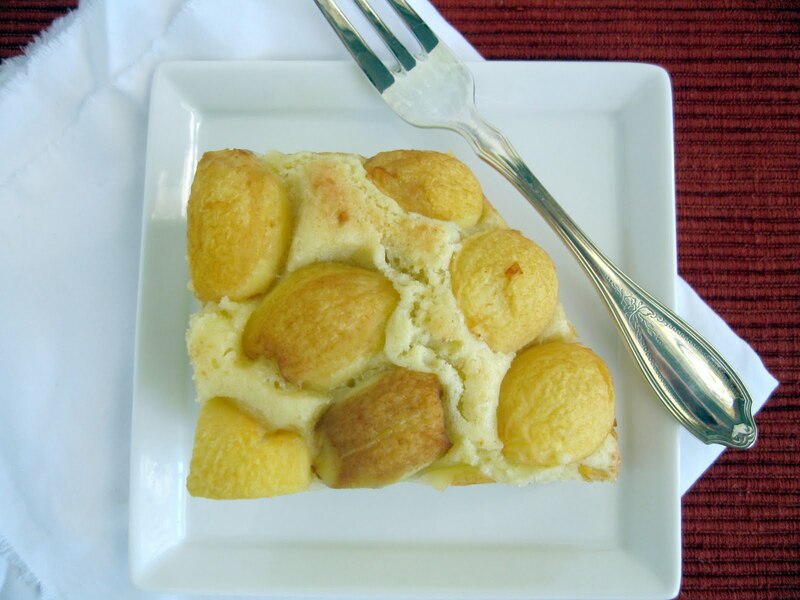 I just love sinking my teeth into this soft and fluffy, tender and moist kuchen studded with pieces of fruit all over the top. In Germany, you'd eat this with a dollop of whipped cream for afternoon Kaffeetrinken, and, since it isn't cloying, I think it makes for a great breakfast treat too. My Opa--a professional baker in northern Bavaria--was one of the hardest workers I've ever known. Even on his vacations with us in Santa Barbara, he'd always want to get into the kitchen and bake us cakes and things. One of the cakes he made for us was this schlupfkuchen, and it was so good I made a point of getting the recipe from him. Now, if you know your botany, you might be wondering what loquats are doing in a German schlupfkuchen! 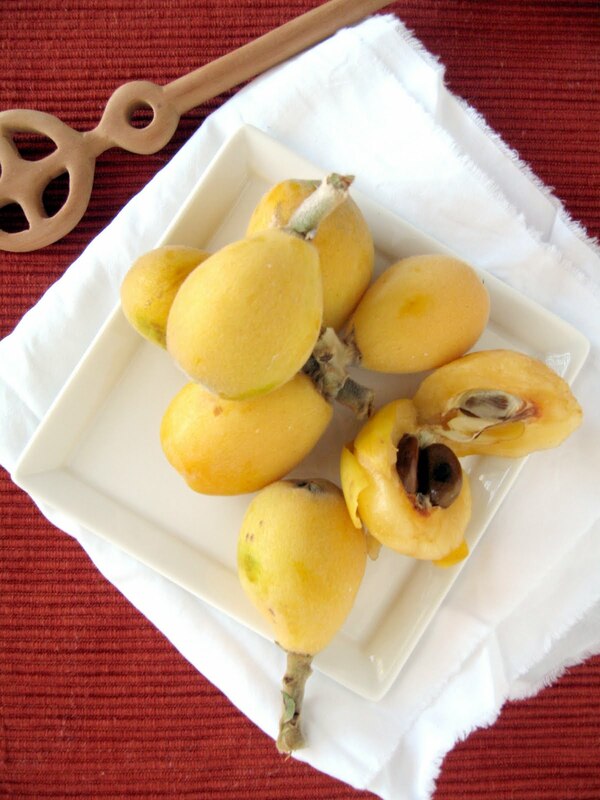 Indigenous to southeastern China, the loquat now grows in many other regions that enjoy subtropical to mild temperate climates, but certainly not in the continental climes of the Bavarian Frankenwald! 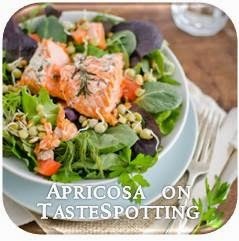 But on a visit to us in Santa Barbara many years ago, Opa, with his inventiveness and German thriftiness, saw our tree laden with ripe loquats and decided to use them instead of the traditional apple or apricot. And the fruit matches the cake so well that I now infinitely prefer my schlupfkuchen with loquats than with any other fruit. In texture, these distant relatives to the apple resemble the soft, succulent texture of a pear. In flavor, they are delicately sweet and sour. 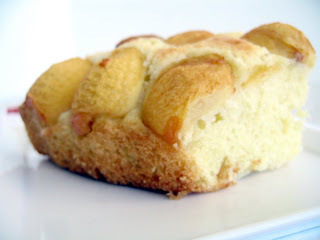 I think they're perfect for this cake, not overly acidic like fresh apricots can be, and retaining a juiciness which apple slices sometimes lose when baked in this fashion. But whatever fruit you choose to use, be sure to use a generous amount and place the pieces snugly together in a layer over the top of the batter; as the cake bakes, the fruit will shrink slightly and "schlupf," or "slip," down into the batter, while the cake rises up in pillowy mounds between and around the fruit. 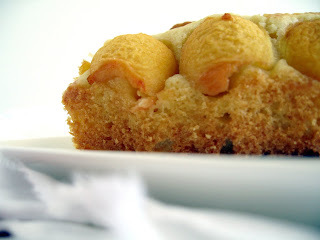 Now, I've got a tree full of loquats, and as much as I love this recipe, I can't eat a tree's worth of cake. Can you help me out here? What are your favorite ways of eating loquats? Cream the sugar and butter. 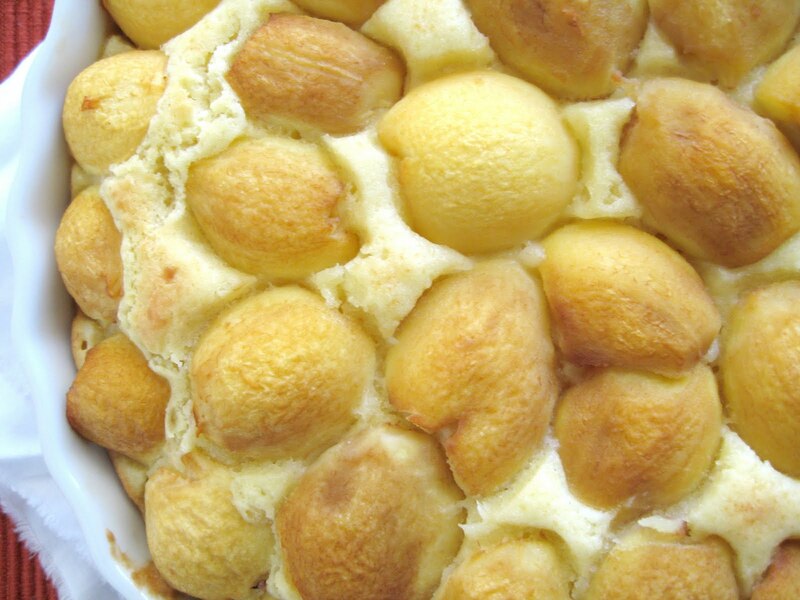 Add eggs one at a time, beating after each addition until creamed mixture is light and fluffy. Combine the flour, baking powder, and salt. Add half of the flour and the milk and gently incorporate. Then add the remaining flour mixture, mixing just until combined. Spread dough in a round 12-inch pan or a 9 x 13-inch pan, and place the fruit, cut side down, very close together on the surface. The dough will rise and spread the fruit apart. Bake at 390 F for 10 minutes, then reduce temperature to 350 F and bake another 30-35 minutes. 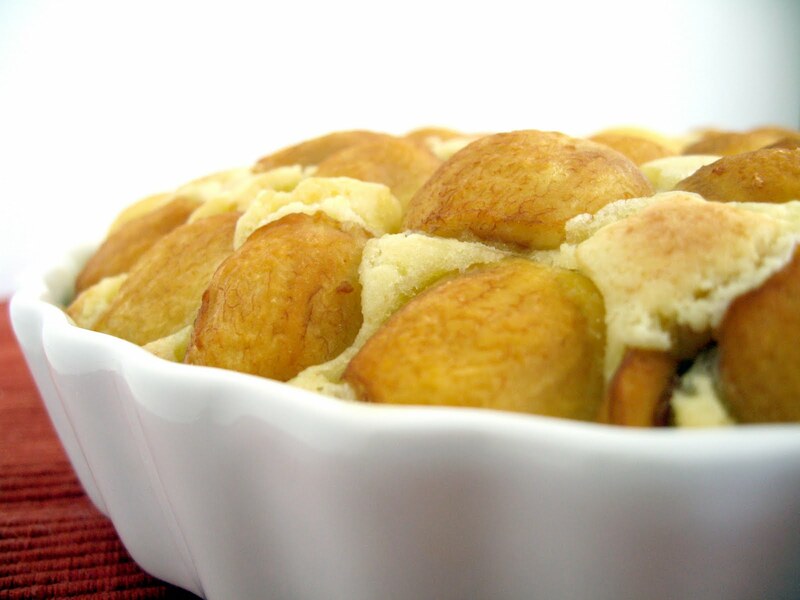 If using a metal pan, check that the bottom does not become too dark. Let cool before cutting. Enjoy as it is or with some freshly-whipped cream! It looks incredible!! I can only imagine how good it must taste.....It makes it that much more special when we learn a recipe from a loved one, I am sure your grandfather would be proud of you for continuing to make this lovely cake! This looks amazing, I love your story, now I just need to try a piece of your cake! i am totally making this. my tree is DRIPPING in loquats. Great pictures and a great story. Can't wait to try this recipe, but I will be using apples since I don't have any loquats.